Christmas is an emotional time for families. With emigration on the rise over the last few years, many Irish people will be spending Christmas day far from their loved ones in the four corners of the world. Regardless of the pre-Christmas madness and mayhem, excess and frenzy, there is no place like home on Christmas Day. For the eight years I lived abroad, coming home for Christmas was my favourite time of year. The plane would always be full of excited travellers on their way back to Ireland to spend time with their families. Beautifully wrapped gifts tumbled down from the overhead lockers as everyone tried to squeeze their loved ones' presents into already stuffed spaces. When the plane landed, we clapped and cheered like excited children. I always remember the lovely feeling of homecoming when I saw the Christmas decorations and the 'welcome home' banners as I walked through Dublin airport. You could feel the excitement in the air as you rushed through the exit doors and heard the squeals of joy as passengers hugged and kissed their loved ones. It always moved me to tears to see the raw emotions as mothers held sons they hadn't seen in a long time and grandparents met grandchildren they'd only ever seen in photos. 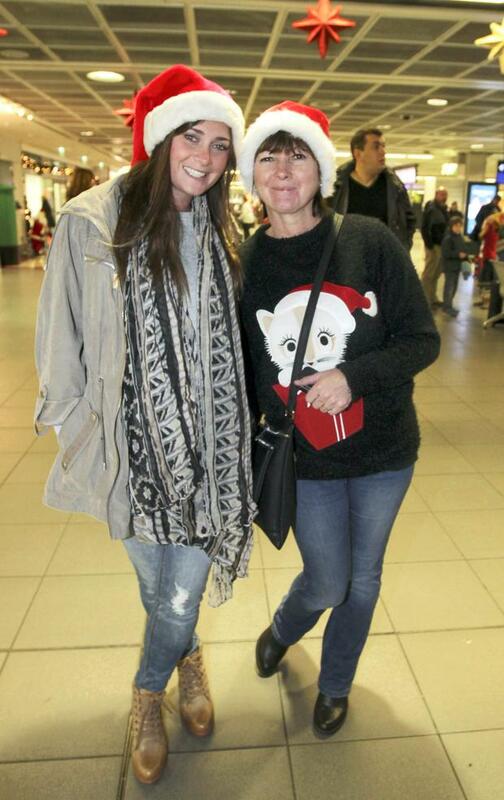 I defy anyone not to feel a tear in their eye witnessing the scenes in Dublin airport on Christmas week. It's a melting pot of joy, sentiment, laughter and tears. The Christmas I remember the most is the one when my sister went to Australia. Having only gone in June, it was too far and too expensive for her to come home for the festive season. We missed her terribly. My mother was terrified that my sister would fall in love with some Crocodile Dundee type and never come home. I think she held her breath for the full year my sister was gone. This was before Skype, mobile phones, Facetime or Viber. My mother would call Australia once every couple of weeks. My father would stand beside her with a stopwatch making sure she didn't bankrupt us with an astronomical phone bill. When the phone bill did come in, it was astronomical. My father pointed out via gritted teeth that my mother could have flown to Australia and spoken to my sister face-to-face for the same cost. On Christmas Day, my mother was doing her best to be upbeat but I knew she missed my sister desperately. We all did. My sister had mentioned, during one of the long phone calls that she was going to go the big open air mass in Sydney on Christmas morning. So we all sat down to watch the two-hour mass in case we might get a glimpse of her. I have to confess to nodding off at one point, but my slumber was rudely interrupted by my mother shouting, "There she is!" The camera paused on my sister's face as her smile filled up the screen. We all whooped and hollered and shouted hello, as if she could hear us on the other side of the world. My father had videoed the mass in the hope that we might spot my sister. So for the whole of Christmas day her face was freeze-framed on the TV screen in our living room. Greatly cheered up by this serendipitous event, my mother made Christmas dinner with a spring in her step. But when we sat down at the table, I realised that I was sitting opposite an empty place setting. "Who's coming?" I asked my brother. My mother came in carrying a perfectly cooked turkey that could have fed the population of a small country. "Who's the guest?" I asked, pointing to the empty place opposite me. "The one we just saw on the TV in Australia?" I asked. My mother nodded, "Yes. She may not be here in person but she's here in spirit. I wouldn't leave her out." As I watch my own children count down the minutes until Santa comes, I know how precious it is to have your children close to you. Christmas is a time of great joy when you are surrounded by loved ones, but a time of great sadness and loneliness if you are not. It's important that we remember those who are not so fortunate and keep supporting the wonderful charities that help people who have fallen on hard times or are feeling isolated and alone. For our loved ones who are celebrating Christmas Day in far-flung places, we can light a candle and set a place for them at the table so they know they are not forgotten, merely absent for now.